The “Berry” Fire, also called the Mount Herman Fire, occurred nearly 23 years ago. At a quick glance, much of the landscape appears to be still largely denuded of trees. The Friends of Monument Preserve, along with help from local Scout troops and other volunteers, has planted nearly 2,000 pine seedlings over the past five years alone. Due to the drought which started in late 1999 and continues to this day, mortality of these seedlings has been fairly high and growth on the survivors relatively low. But an estimated two-thirds of these seedlings are still focusing on developing healthy root systems, and should show soon vigorous crown growth. 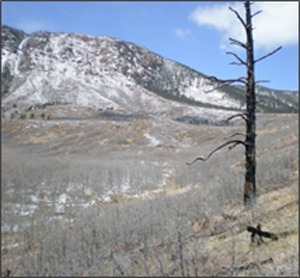 Planting in portions of the burn area is essential, since much of the seed source was destroyed. The predominant ponderosa pine produces heavy seeds, which typically disseminate within 75’ of the parent tree, unless carried by birds or other animals. With good cone crops averaging once only every five years, ponderosa pine produces a limited amount of seed for new regeneration. When coupled with dry conditions the following spring, natural seedling establishment from existing pine trees is tenuous, and may take considerable time. Perhaps decades. High hopes for plentiful new seedlings from a strong pine cone crop in 2009 were dashed by one of the driest springs on record in 2010. To facilitate establishment of a robust and genetically-adapted forest across the burn area, ponderosa pine seedlings are grown from seed that was collected on the Pike National Forest. Colorado is divided into seed transfer zones which reflect physiographic, climatic and geologic similarity. Seed collected from the same seed zone at a comparable elevation (+ 400’) to the planting site is grown into healthy young seedlings by the U.S. Forest Service Bessey Nursery. The one-year old trees that are planted this spring should be producing their own cones within 15 years, bolstering establishment of the future landscape. 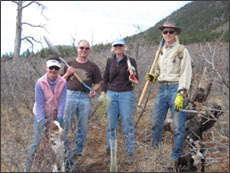 FOMP plans to plant 200-300 trees this spring, and will be looking for enthusiastic volunteers to assist with this! Project date will depend on soil moisture conditions, but is tentatively scheduled for April 7 at 10:00 am, with a backup date of April 14. It would take a keen eye to spot the thousands of young Douglas-fir seedlings that have established naturally across the burn area. A more moisture loving species than ponderosa pine, Douglas fir is found primarily on north slopes and scattered ridges in the area. Fir can grow under heavier shade than ponderosa pine, and has thus been able to germinate and establish under thickets of Gambel oak that have re-sprouted since the 1989 fire. Douglas fir has more frequent heavy cone crops at every 2-3 years. Its featherweight seeds can travel considerably farther on the wind, resulting in more widespread natural regeneration. But oh that oak! While a mature landscape in this area boasts beautiful clumps of huge Gambel oak stems with a soft grassy understory interspersed with scattered yellow-barked ponderosa pine, most of these old oak stands were knocked back in the fire and replaced with dense impenetrable oak thickets. These have proliferated greatly in the last 20 years. Although Gambel oak will always be an integral part of this ecosystem, much of this juvenile oak will eventually succeed to conifers. Eventually is the key word here. In the meantime, it will likely choke out at least half of the hopeful young Douglas-fir (and a few scattered young pines), significantly slowing natural succession. Many of these seedlings would have soon succumbed due to the overtopping brush, with annual terminal growth decreasing to just an inch in some cases. Our job here is to cut back just enough of the competing oak to give these young seedlings a fighting chance. Focusing on oak stems that most compromise sun-light, we exercise care in scattering cut brush to address aesthetic and fuel load concerns. A passerby would have to look long and hard to notice where this activity has taken place. The occasional old-growth oak pockets that survived the fire are a treasured part of the landscape, and would not be affected by this project. But there is no shortage of second-growth young oak, claiming a vast majority of the 1,000-acre burn area. Volunteers are needed to help to release these seedlings. It is hard work but a lot of fun – akin to a treasure hunt. Very tangible and rewarding, one can almost sense the new lease on life realized by the handsome young seedling seeing the sunlight for the first time in years. We plan to release seedlings on our monthly Tuesday work evenings starting in May, in addition to a Saturday or two this spring if interest warrants. For more information on reforestation projects in the Preserve, please contact info@fomp.org. Watch for FOMP emails to see when various projects will be taking place. This entry was posted in Nature/Ecology on March 4, 2012 by chris. As in previous years around the end of March, the 4H kids from Black Forest and I are planning to do a day of repairing and cleaning the blue bird houses in the Preserve to get them ready for a new season. During the winter, the 4H group works under the guidance of Frank Puckett in their woodwork shop/class to build these bird houses to specifications published by Donald and Lillian Stokes, authorities on the subject. The bird houses are built with raised metal screen floors to keep parasites at bay, ventilation holes, slats on the inside below the entry hole for the young ones to climb, and small entry holes with predator guards to keep bigger birds from accessing the houses and robbing the brood. Even so, the gentle Blue Birds have to share the houses with Tree Swallows, Chickadees, Nuthatches and Wrens which all seem more aggressive. 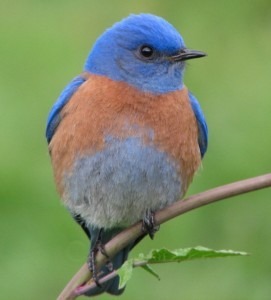 Most of the frequent hikers in the Preserve excitedly share the news with each other about the first spotting of the Western Blue Bird. They may not be the swallows of Capistrano, but for the Preserve they are the messengers of spring. Over the last 15 years that I have monitored the nesting boxes, the “blue bird trail” has grown to over 20 bird houses. It is very enjoyable to have these colorful birds around.